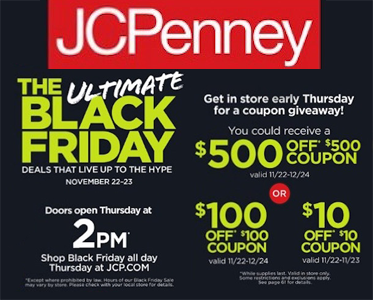 JCPenney will be giving away $500 off $500, $100 off $100 or $10 off $10 coupons on Thursday November 22nd! Doors open at 2PM. Each offer good in store only. $10 off $10 valid 11/22/18 -11/23/18. $100 off $100 and $500 off $500 valid 11/22/18 -12/24/18. 1 in 100 coupons is $100 off $100, 99 in 100 coupons are $10 off $10. Additionally, each store will have at least one $500 off $500 Coupon. Note this is for 18yrs and over only.